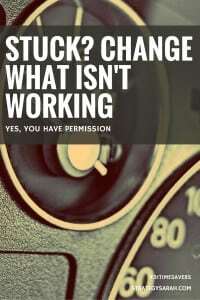 Have you ever felt stuck to a degree that it’s impossible to change? You have the power to change your schedule. Really. Just like we talked about stopping to check whether or not a particular task truly needs to be done, it’s often good to step back and evaluate what’s working and what isn’t. I realized recently that our morning routine of getting everyone up, ready and out the door wasn’t working. More days than not, the last 10 minutes before we left the house were frantic. I was that stressed, rushing mom all too often, hurrying my kids when they were just acting their age. The hurrying was a result of my lack of realistic planning, not anything they were doing wrong. I am learning to reset my expectations for when we need to leave the house. If I’m not stressed about getting to work on time, then stopping to look at the leaf on the ground, or tell me one more story, or procrastinate on putting a jacket on is no big deal. Similarly, maybe you have too many commitments on your plate. What needs to be removed? What should be added? Information overload is another big one. How’s your email inbox? Do you need to unsubscribe to any email lists? Yesterday we talked about various ways to save information, but maybe there’s just too much coming in. I regularly go through and unsubscribe to blogs I follow, email lists I’m on, and more. What business did you sign up for a coupon from and now endlessly delete (or ignore) their emails? Unsubscribe liberally (Tool tip: Unroll.me is a great FREE service to make this easier). Life does often seem crazy and out of control. But more often than not, if we step back and think strategically, we have more power to make change than we think we do. Today’s challenge: Identify one area that you feel stuck and determine a path to change. Now that you’ve created a few different to-do lists, it’s time to tackle time. As in, using a timer. We have an endless variety of timers in our house. There’s the bedtime timer, the naptime timer, the dinner time timer, the time out timer, the “it’s time to leave” timer, the “we’re done watching shows” timer – you get the idea. A timer separates the emotion from the task. A timer also adds structure to our day and routines. Even as an adult, it’s easy to say, “Oh, just one more [minute][snack][post][chapter].” This can lead to procrastination, over-indulging or never doing what needs to get done. I am truly terrible at estimating the amount of time it takes to do a particular task. Particularly for tasks I loathe, I vastly over estimate the amount of time it actually takes. Even when it’s tasks and projects I want to do, I tend to overestimate how much I can get done in a given time frame. A simple solution: Include an estimate of how long each task will take directly on your to-do list. This allows you to see up front where you have overcommitted yourself or where you have more bandwidth. 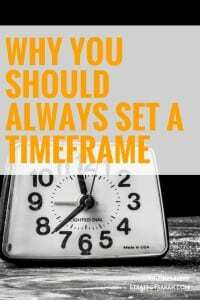 For example, the day that I had what seemed like a reasonable number of tasks – until I listed out the estimated time frame – and I had 6.5 hours of work slated for a 4 hour block of time. No wonder I always feel behind! An added bonus is that if you are consistent with estimating time for each task, your time estimating skills will quickly become much more accurate. While any old timer will work, I tend to use the built-in timer on my iPhone most frequently. Occasionally, I’ll also use the stopwatch if I’m not sure how long a task will take and want to track the total time. 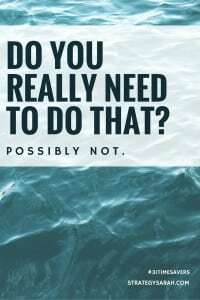 One of the biggest time drains out there is doing things that don’t actually need to be done. We all have a tendency to overcomplicate – both in our personal lives and our professional lives. Similar to prioritizing your Daily Six, identifying what doesn’t actually need to be done can save boatloads of time. Do you really need to do that personally? Do you really need to drive to the store to buy that, or can you do it online in a fraction of the time? Do you really need to call, or can you update your information online? Last night I ran the dishwasher, but didn’t finish the dishes that needed to be hand-washed. All dirty clothes were put in the laundry and clean clothes put away, but a big ol’ pile of toys was left on the floor. Finishing the dishes and picking up toys would have only taken 15-20 minutes, but instead I spend that time paying several bills and prepping items for a meeting and errands that need to be run today. The toys and dishes won’t take any more time today than they would have yesterday. For errands that do need to be done, is there a way to combine tasks or plan your route to hit as many as possible all at once? What do you need to prepare ahead of time to have what you need, when and where you need it? Do you really need to do that professionally? In the workplace, the most common areas I see work that doesn’t need to be done is recurring meetings and recurring reports. 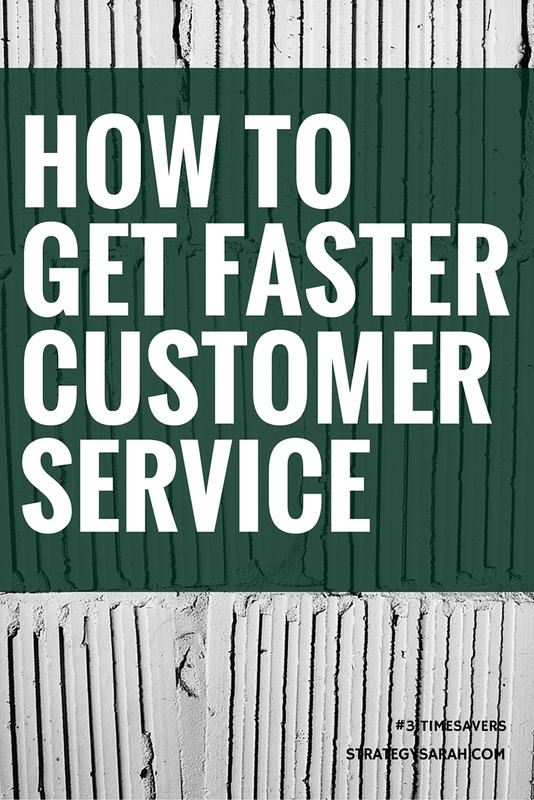 Want to know if people are truly paying attention, and if your communication is adding value? Write a sentence in the middle of the report or meeting invite that makes no sense at all. Or something along the lines of, “If you’re reading this, please come see me.” See who says anything and when. Adjust your future messaging accordingly. On meetings, if people consistently cancel or don’t show up, it’s probably time to re-evaluate whether or not the meeting is necessary. Likewise, if you’re the one skipping meetings with increasing frequency, consider saying something to the meeting organizer. Would everyone’s time be better served if the meeting was bi-weekly or monthly? Does there need to be a written status update in between? Can the meeting transition to just written updates? 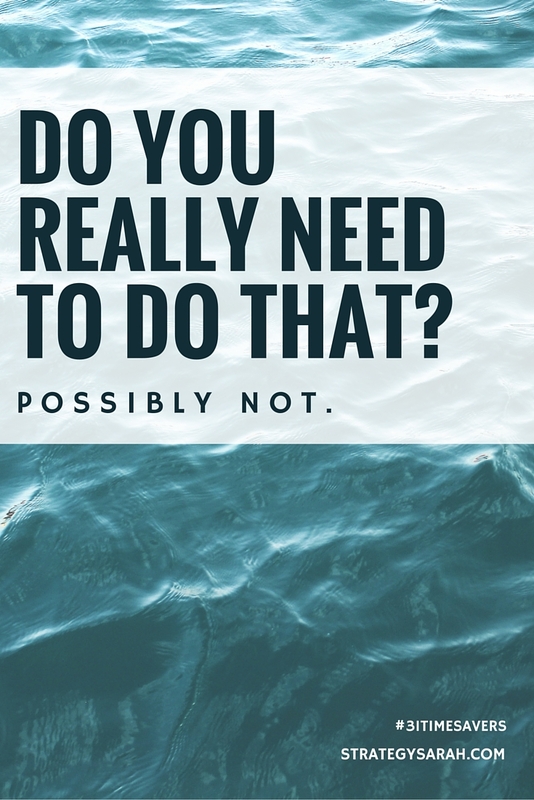 Today’s Challenge: Before you do anything, stop and ask yourself, “Is this truly necessary? What happens if I don’t do it? Is there a simpler way to accomplish this?” Report back with your results in the comments. 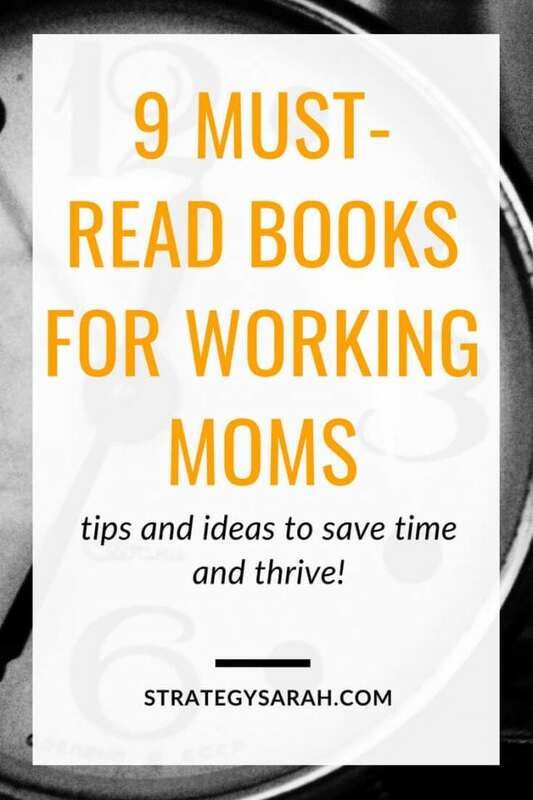 As a busy working mom, I’m always looking for tips and ideas for awesome time management books to increase my productivity and well being. I love to read, and read (more than) my fair share of beach read, fluffy fiction. I have an equal love of non-fiction in the business, productivity, and time management realm. The case studies and stories of people’s lives are so fascinating! I love to learn from both the official practical tips, formal studies and life stories shared. 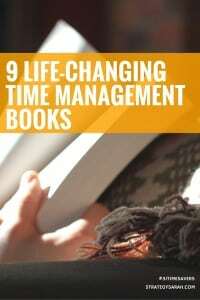 These nine books from experts on time management and productivity are favorites that I reference often. There’s a great balance of quick reads (because we are busy moms!) with practical tips, more in-depth research studies and commentaries, and food for thought. Tell Your Time is short, but backs a serious punch. Amy’s no-nonsense, straightforward manner is fantastic. A practical, quick-to-implement read at $2.99, this is my number one pick if you had to choose from this list. 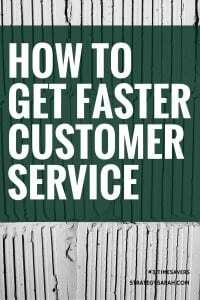 If you’re short on time to dedicate to reading and want a simple, practical, actionable steps, start here! “Working hard is important. But more effort does not necessarily yield more results. ‘Less but better’ does.” <– This. Paine was one of the first bloggers I followed consistently, and her growth as a blogger, business owner and person has greatly inspired me over the last eight years. 21 Days is a straightforward workbook to help focus, prioritize and gain discipline. My favorite parts about Overwhelmed are the number of research studies and thorough approach. Schulte’s background as a journalist shines in the best of ways. The endless energy that Turner has to fit so.many.things into her fringe hours is impressive. I admit to feeling daunted by just how much she fits in her days. At the same time, she talks about how much she truly enjoys all that she does. The concept of fringe hours, and fitting important, soul-filling activities into pockets of time is fantastic. Reading this book inspired me to be more intentional about using small pockets of time for intentional reading (love my Kindle app!) rather than mindless Facebook or web surfing. The GTD methodology has a near cult-like following. While I’ve incorporated many of the ideas from GTD, I have never been successful at implementing the full process. My “GTD Lite” process has served me well without overcomplicating. I love, love, love Vanderkam’s no-nonsense approach that of course working moms have enough time to do it all – as long as we prioritize what “all” is to us. 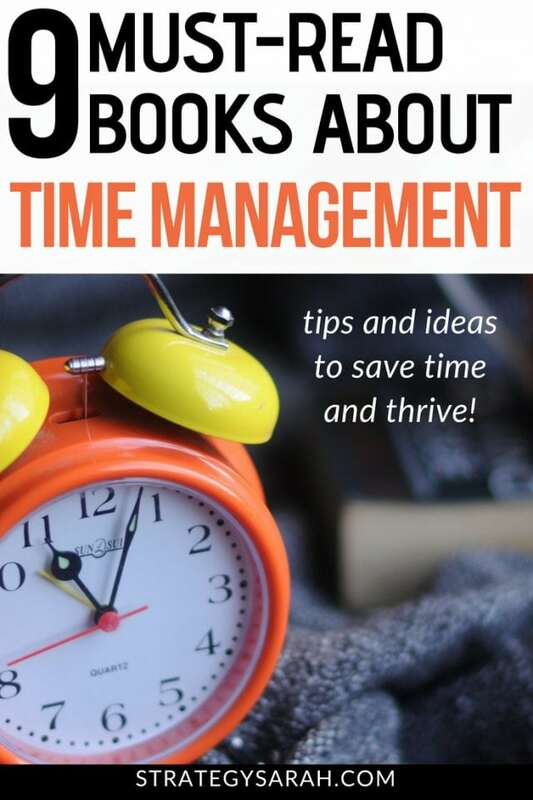 Vanderkam’s other books, Off The Clock: Feel Less Busy While Getting More Done and 168 Hours: You Have More Time Than You Think are also awesome reads. Margin was on a book list for one of my college classes. I’m sure I read the required excerpt, but it was only a year or two ago that I made it through the entire book. This one is more academic than some of the others (read: not a quick read, but worth it to go in-depth). Adding any one of these nine time management books for working moms to your reading list will give you awesome tips, ideas and thoughts to better manage your time and thrive at home, work and play. Why yes, these links are affiliate links, which means that if you make a purchase, I get a small commission. Your price remains exactly the same. You pay the same price and I get paid? That’s a no-brainer, right?